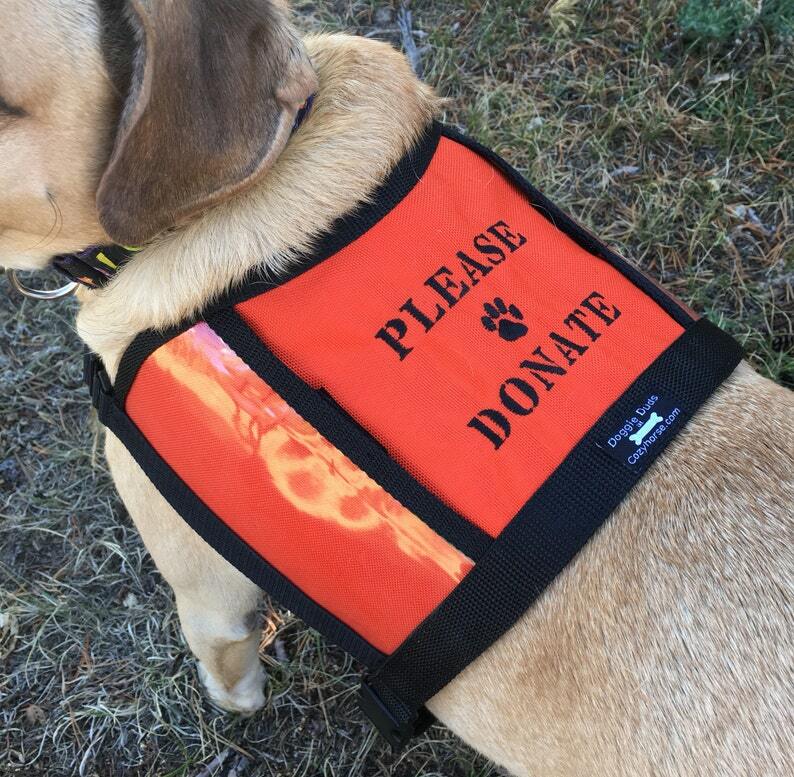 Lightweight, adjustable fundraiser vest for dog events. Perfect for rescues and fund raisers. Donation pockets are large and clear which make donations visible and people more likely to give. Both the neck strap and belly strap are adjustable. The belly strap has a quick release buckle for easy on and off. The large pockets have a velcro strip at the top center so that the pocket can be held down but also opened up completely. Vest color is orange with black trim. "PLEASE DONATE" embroidery is black. S/M (8" front to back x15" side to side) Belly strap adjusts from 24" - 30"
This size works well for smaller stocky dogs and medium dogs with a slender build. Love the color and size. Fits my YupCollars harness perfectly! Credit cards and Paypal are welcomed. I no longer accept personal checks. RETURN POLICY FOR CUSTOM ORDERS: Due to the nature of custom work, I am not able to provide any refunds, returns or exchanges. If you have placed an order for a custom made item, it is a binding contract. Please understand this policy before purchasing! Again, CUSTOM ORDERS OR MADE TO ORDER ITEMS CANNOT BE RETURNED or exchanged as they are made to YOUR color/size/style specifications. No exceptions! UNAUTHORIZED RETURNS FOR ANY SUCH ITEMS WILL BE REFUSED. If you purchase a ready made item from my store (NOT CUSTOM OR MADE TO ORDER) an exchange may be made. Customer is responsible for all shipping charges on exchanges made. The item must be returned in the same condition that it was received in and must be able to be resold as NEW. It can not be soiled or smell of cigarette smoke or perfumes. If you bought something and it is the wrong size please contact me right away BEFORE returning the item for an exchange. Exchanges are made after the item is received here. THE ITEM MUST BE RETURNED WITHIN 7 DAYS OF THE PURCHASE DATE IN THE SAME CONDITION IT WAS RECEIVED IN. When an item is shipped, an email with a tracking number is sent to the customer. Any item shipped via priority mail will also have insurance. Once the item leaves my shop it is up to USPS to get it to your door. If in the unlikely event an item is lost in the mail it is the customer's responsibility to contact their local post office with the tracking number that was provided in the email that was sent when the item was shipped. The customer is also responsible for making sure that their shipping address is correct when placing an order. Due to the nature of my work, I do not offer discounts or wholesale pricing. Occasionally I will accept a custom or personalized order.